You can also enable automatic configuration for instant messaging applications that use XMPPExtensible Messaging and Presence Protocol is a protocol used for real-time communication (chat).. For more information refer to Configuring DNS for instant messaging. Autodiscover uses several methods to locate the responsible server for an email address (refer to the Microsoft Documentation for full details). After locating the responsible server for an email address, the application opens a secure connection to the mail server to download an XML file containing the connection parameters for the mailbox account. Secure connectivity (HTTPSSecure version of secured by SSL.) is accessible to your Kerio Connect server from the Internet. For more information refer to Securing Kerio Connect. Your Kerio Connect server's SSL certificateSSL certificates are used to authenticate an identity on a server. is signed by a trusted certificate authority (CA) such as InstantSSL by Comodo. or RapidSSL. For more information refer to Configuring SSL certificates in Kerio Connect. If you have a web server or other type of server that is accessible via HTTPS when connecting to the root level of your domain (e.g., example.com) you must be sure that the SSL certificate presented by that server (usually your web site) matches your root domain name and the certificate is signed by a trusted CA. You can use online tools such as sslshopper.com to test the accessibility and validity of your server's SSL certificate. 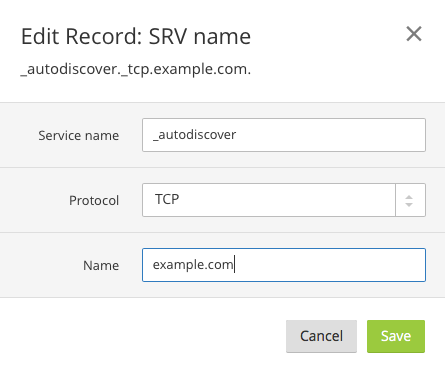 You do not have a CNAME or any host record for your domain that resolves "autodiscover". The Internet hostname of your Kerio Connect server matches the name on your SSL certificate. For more information refer to Internet hostname. All users in Kerio Connect have a full name assigned to their account (the full name must not be empty). For more information refer to Creating user accounts in Kerio Connect. Your DNS hosting provider supports SRV configuration. See below. You can verify your Autodiscover configuration using the Microsoft Remote Connectivity Analyzer.